Members of Gamma Sigma Omega in their South Atlantic Regional white jackets. Alpha Kappa Alpha Sorority, Incorporated 61st South Atlantic Regional Conference was held April 2 – 6, 2014 in Jacksonville, Florida. The Savannah Chapters; Gamma Sigma Omega, Gamma Upsilon (Savannah State University) and Sigma Tau (Armstrong State University) attended and garnered recognition for their efforts in the Savannah-Chatham area and their contributions to Alpha Kappa Alpha. 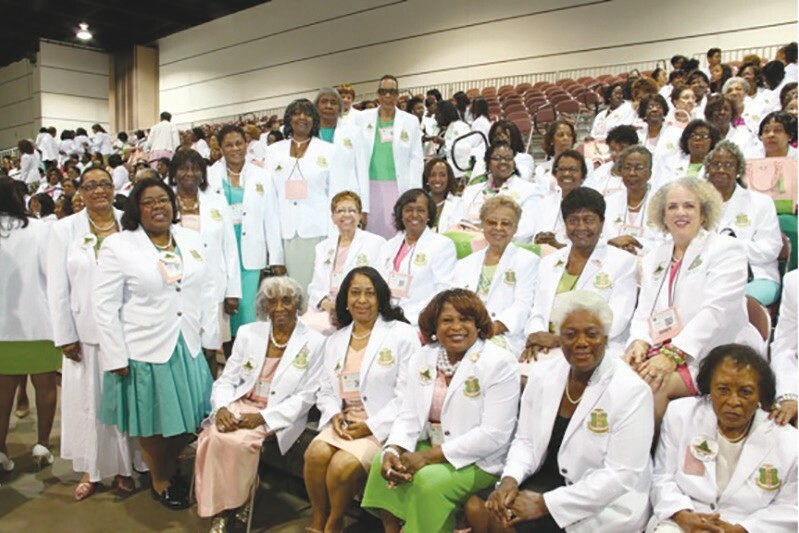 As a result of their Regional awards placement, Gamma Sigma Omega and Sigma Tau will be recognized internationally at Alpha Kappa Alpha 66th Boule to be held in Charlotte, N.C. July 12-18, 2014. Both Gamma Upsilon, under the guidance of Tara Scott Brown, and Sigma Tau volunteered to pass out information to the international and regional leaders and delegates at two sessions of the conference. Tarangula Barnes Scott, Gamma Sigma Omega President, supports the chapters and encourages all members to maintain a presence in the Savannah community to promote our commitment “to serve all mankind.” Alpha Kappa Alpha Sorority, Incorporated is an international service organization dedicated to improving the quality of life for citizens worldwide and promoting peace.